There may not be words in every language describing a particular thing….. in Kamal starrer comedy film ‘Thenali’ there was a hit song ‘ஆலங்கட்டி மழை தாலாட்ட வந்தாச்சா?’….. the word ‘Alangatti’ … is a peculiar one…. It would mean ‘hailstorm’ – which is not regular in these parts of the land – though it would occur in Northern parts of our Country. A storm is any disturbed state of an astronomical body's atmosphere, especially affecting its surface, and strongly implying severe weather. It may be marked by strong wind, thunder and lightning (a thunderstorm), heavy precipitation, such as ice (ice storm), or wind transporting some substance through the atmosphere (as in a dust storm, snowstorm, hailstorm, etc). Hail is a form of precipitation that occurs when updrafts in thunderstorms carry raindrops upward into extremely cold areas of the atmosphere where they freeze into ice. Hailstorm - a type of storm that precipitates chunks of ice that aren't snow. Hailstorms usually occur during regular thunder storms. While most of the hail that precipitates from the clouds is fairly small and virtually harmless, there have been cases of baseball and golf ball sized hail that caused much damage and injuries. Wind has various names – going by the geography and by the speed. Though there are various methods for determining the speed of the wind (not the devastation so caused) – the most popular is ‘beaufort scale’ - which is an empirical measure for describing wind speed. Its full name is Beaufort Wind Force Scale; created by Sri Francis Beaufort, a British Admiral and Hydrographer in 1806. The Beaufort scale is divided into a series of values, from 0 for calm winds to 12 and above for hurricanes. Each value represents a specific range and classification of wind speeds with accompanying descriptions of the effects on surface features. A strict meteorological definition of a terrestrial storm is a wind measuring 10 or higher on the Beaufort scale, meaning a wind speed of 24.5 m/s (89 km/h, 55 mph) or more; however, popular usage is not so restrictive. Storms can last for hours together and can cause great devastation. Big terrestrial storms alter the oceanographic conditions that in turn may affect food abundance and distribution: strong currents, strong tides, increased siltation, change in water temperatures, overturn in the water column, etc. In India, the fire policy coverage is under Standard Fire Policy specifies the ‘insured perils’ ….. “STFI” is a named peril… it actually is a group of wind and water perils …. “Storm, Cyclone, Typhoon, Tempest, Hurricane, Tornado, Flood and Inundation”. As could be deciphered, only such damages caused by the action wind, the speed of which could be classified as ‘storm, cyclone, typhoon, tempest, hurricane, tornado’ is payable … though commonly it is believed that strong gale winds causing damage is indemnifiable. Going by the beaufort yardstick, the strong or gale winds would not be within the ambit of the policy but only damages caused by winds of speed over 89 kmph or 55 mph. The subtle difference is so well pronounced. 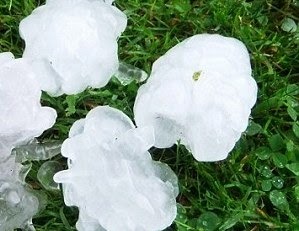 Here is a photo showing the size of ‘hail’ and the damage caused by a hailstorm. Hail damaged roof and bonnet of a car…. PS : circulated to my group of friends in 2007 and posted here now. The erstwhile TAC has issued lot of circulars. In one of the circulars they have specifically stated that Hail Storm is covered under Fire cover. I have settled one large claim of around Rs. 50 lakhs (settled by Board) for the damage to the machinery caused by the hailstorm.Your observation is right but for the specific circular the claim could not have been settled. Let's perceive it other way for the sake of debate, I reproduce the definition you have stated for storm which is "A storm is any disturbed state of an astronomical body's atmosphere, especially affecting its surface, and strongly implying severe weather. It may be marked by strong wind, thunder and lightning (a thunderstorm), heavy precipitation, such as ice (ice storm), or wind transporting some substance through the atmosphere (as in a dust storm, snowstorm, hailstorm, etc). So as per definition storm may be marked by strong wind also which is nothing but a Strong gale. Despite meteorological department describes storm based on the wind speed specified by Beaufort scale, no where in the policy there is a reference made to storm on Beaufort scale. Being a layman, policy holder will interpret only the common definition, therefore in his view strong wind or gale is also classified under Storm irrespective of the intensity. As storm is not defined in the policy(based on wind speed)leaves an ambiguity,so benefit of doubt should be given to the insured as he has really suffered a loss due to strong wind (act of god peril). Just a thought, correct me if i am wrong. Thank you!